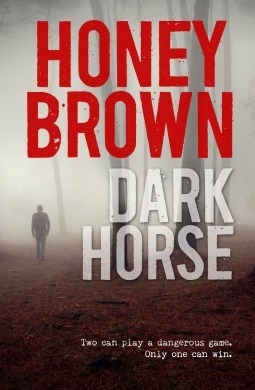 Having read After the Darkness last year I thought I knew what to expect from Honey Brown and while I was rewarded with a compelling story of psychological suspense, the shocking twist in the tale of Dark Horse took me by surprise. After a messy divorce and the reluctant sale of her property Sarah Barnard can’t face a day of forced celebration with her parents and so just after dawn on Christmas morning, she packs supplies and canters into the bush upon her beloved horse, Tansy. Distracted, Sarah doesn’t notice the change in the weather until a torrent of water is rushing towards her. With no way to retreat, Sarah and Tansy are forced to seek higher ground and take refuge at the site of an old bushranger’s hut in the midst of being renovated. Resigned to waiting for rescue, Sarah establishes camp, content in her solitude, but then a man calls to her from the darkness, and Sarah is no longer alone. From the moment Heath whistles to Sarah from the edge of the campsite I believed I knew the path the story would take but the twist in the plot left me breathless, catching me unaware. In hindsight the clues are there in the story, hiding, at times, in plain sight, but Brown masterfully plays on the reader’s expectations and with careful, but never obvious, manipulation, subverts the truth. Sarah’s reason for being on the mountain is seemingly clear while Heath is the enigma. He appears untruthful, giving vague answers to even the simplest of questions and as Sarah’s suspicion of him grows, so does ours. The tension builds as Sarah battles her intense attraction to Heath, who is young, fit and handsome, even though she suspects him to be dangerous. Brown skillfully develops a relationship between Sarah and Heath that is, if not entirely understandable, feasible, despite the obvious contradictions. The sense of unease that permeates the narrative comes not only from the situation but is also carefully cultivated by Brown as she creates a disquieting landscape of thick fog, unstable ground and howling winds. Lashed by rain and in danger of flooding, the mountain is a threatening presence. Sarah and Heath’s battle against the elements, and their isolation, heightens the suspense whilst enforcing intimacy with the need to keep dry and warm. Once begun, I found it impossible to put Dark Horse aside. The pace is compelling, the tension superb and the plot veers into a breathtaking twist. Dark Horse is a finely crafted, stunning psychological thriller that I can’t recommend strongly enough. Oh, *great* review! I just wrote mine and it’s a similar gush-fest because Honey Brown is just that good 🙂 the twist in ‘Dark Horse’ had me gasping. I can’t wait for her next book now. I neeeeeed it! 5 stars wow, I really want to read Honey Brown. I am a little unsure now of the manipulation, I have been very angry in the passed with this style. If it is not over done and more of a psychological twist I will fully enjoy. Great exciting review. Oh wow, sounds fantastic… I just love it when as a seasoned reader an author can still blindside us. WOW I had a feeling this one would be brilliant. Fantastic review Shelleyrae and the book trailer is fantastic. I sure hope this mystery novel is available here in Canada because your review has me hooked!